Bringing your special-needs or struggling student home for his education can be a wise and loving thing to do, especially if you cannot find an accommodating classical school nearby. As the child grows older, social rules become more complex. Expectations for organizational skills exceed abilities. Transitions prove challenging. Classical Christian homeschooling may sidestep these difficulties with a tutorial approach to include classical teaching methods, a classical curriculum, character formation, and nurturing instruction in the Christian faith. Enjoy classical teaching materials, but modify. Progress more slowly or at a lower level. Do some lessons orally, instead of requiring all written components. Enjoy supplementary resources. For example, when teaching Latina Christiana I, include the puzzles in Ludere Latine I and the beautiful music from Lingua Angelica. If your child receives therapies, inquire about obtaining speech, occupational, or physical therapy privately or through the public school. Incorporate some of his therapy exercises into your academic program. For an ongoing reference guide with true stories, lists of resources and specific strategies, tips for individualized assessment, and encouragement to assist you with any child in your own school or homeschool, consider Simply Classical: A Beautiful Education for Any Child from Memoria Press. *from The Latin Letters of Roger Ascham and Johann Sturm, 1550, quoted in The Great Tradition, Richard Gamble, ed. Wilmington: ISI, 440. Questions from our Struggling Students online discussion group. Cheryl Swope, M.Ed. has homeschooled her 18-year-old adopted special-needs twins from their infancy with classical Christian education. She holds a lifetime K-12 state teaching certificate in the areas of Behavior Disorders and Learning Disabilities. She has worked with special-needs children, youth, and adults for over thirty years. 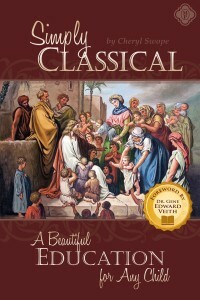 Cheryl is the author of Simply Classical: A Beautiful Education for Any Child.